Sometimes grownups are less mature than their own children. Some friend gives them this kind of advice, and because they are deeply hurt over a betrayal in the marriage, they think maybe the friend is right. It’s true that children are resilient, but it’s not true that children of divorce wil be “just fine.” They are the most hurt participants in this tragedy; they lose the most, they have to adapt to change the most, their financial circumstances are often affected the most, they have more to lose than anyone else. And perhaps most difficult of all, they almost always have to deal with some new person entering their lives as a step-parent, often accompanied by step-siblings. Their whole world is rocked. There are tons of studies that have been done on this subject. 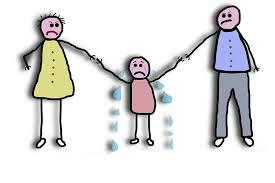 They detail both the short-term and long-term effects of divorce on children. Some of them make for pretty dry reading. I did some research on the topic for a paper of my own when I was working on my master’s degree, and I have to tell you that my eyes crossed sometimes while I was doing the research. More important, though, is the heartbreak that accompanies the process and results of divorce, both for the parents and the children. Divorce often seems like the only possible answer, but it also often opens a host of new problems. If you are interested in reading about all this, I found an excellent paper that goes into a lot of detail supported by linear studies. You can find it here. The paper covers the whole range of topics that children of divorce cope with, from matters of faith to education, income and earning capacity, crime, abuse and neglect, drug use, government services, health and well-being, and so on. Not every child will experience every problem. Some divorces actually do make the child’s life better, if one of the parents is abusive, alcoholic, drug-addicted, or criminal in other ways. I had one young man tell me that the best day of his life was when his father got carted off to prison. The second-best day was when his mom’s divorce decree was final. I’m not being naive here. I know that there are situations like that one. However, the usual story is not like that, and children are often the victims who are overlooked in the process of the divorce, and are expected to happily move from mom’s to dad’s and back again for the rest of their growing up years. It’s hard, and there’s just no way around that. I’d encourage you to read the article. If you are in a difficult marriage, please move heaven and earth to figure out a way to avoid divorce. Your kids don’t deserve to have to endure the fall-out.